There are problems inherent in making a biopic of a movie star who is still active, and young enough for all his many shenanigans to have been meticulously reported by the then brazen film press, and a lot by the mainstream media. If the said biopic is made by a successful filmmaker who is also a friend, and obviously with his subject’s approval, the bits selected to be presented are the ones that make him look either a victim of fate and circumstances or a brave hero. Rajkumar Hirani’s Sanju could have been, but is not a warts-and-all biopic. It is a highly fictionalized and sanitized version of the Bollywood hellraiser. From all accounts, Sanjay Dutt has lived his life openly—all his misdemeanours, affairs and problems with the law are all documented, and he has come out of it, to now lead a stable family life; why would he want to apologize for his past now, or have Hirani do it for him? The fact that he has been forgiven and the slate almost wiped clean is proved by armies of fans, who call him “Baba” with familiarity and a certain admiration. 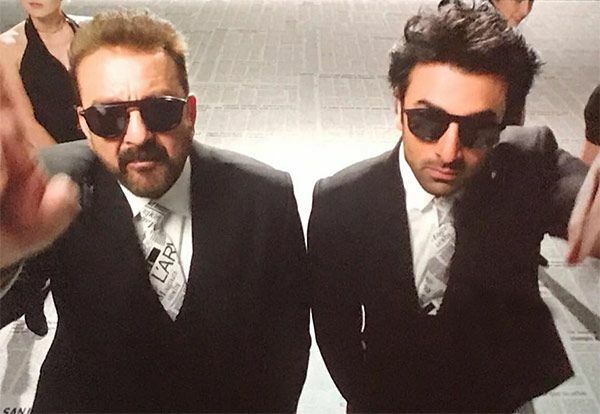 See it as a film about the rise, fall and rise of a spoilt rich brat, as a story of love and loyalty, and the film works—because Ranbir Kapoor is a terrific actor, and Hirani as much of a master storyteller as he is a manipulator of emotions. Still, he cannot resist using a very clumsy framing device of a writer (the “world’s best biographer” first seen photographing a museum!) Winnie (Anushka Sharma), who is desperately sought by Sanjay Dutt and his wife Maanyata (Dia Mirza) to write a book on him. She is skeptical, but when he starts telling her chapters of his life, she is reduced to tears and ostensibly writes a book that tells the truth about him, perhaps standing in for the filmmaker himself, or even the audience that wants to see a true story and get a full emotional family drama. The first half is about the launch of his career by his doting father Sunil Dutt (Paresh Rawal, terribly miscast), his drug addiction, his mother’s (Manisha Koirala as Nargis) death, the break-up with his girlfriend Ruby (Sonam Kapoor), his genuine friendship with the devoted Kamlesh (Vicky Kaushal--outstanding! ), his fight against addiction and bashing the two-faced drug-peddling buddy (Jim Sarbh). His career highs and lows or the various affairs that the gossip mags reported, are pointedly ignored. The second half gets grim, when he is caught for getting a gun from the underworld, accused of being a terrorist and sent to jail. His father and Kamlesh resolutely stand by him, the former sleeping on the floor, without a fan, because his son suffers prison travails. In the end, the blame for all the trauma the family faced is laid at the doorstep of a sensation-seeking media; there’s even a song to that effect with the end credits, when the real Sanjay shakes a leg with his screen avatar. There’s a lot that’s debatable about the film, but if the dramatic scenes with the father are really moving, there are also distasteful comic sequences, especially two involving Ruby (the awful toilet seat around her neck scene is in the promo) and her family, and one when Sanjay seduces Kamlesh’s girlfriend. One supposes, Hirani had to serve a cocktail to suit every palate and he has made a film that will appeal to the masses.